Ensure a comfortable room temperature, neither dangerously hot or too cold. Room thermometers can help significantly with energy costs with a small adjustment to the thermostat saving vast amounts on fuel bills every year, and reduce your carbon emissions. 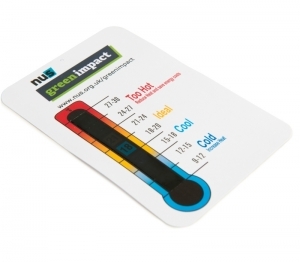 This room thermometer card has a large easy to read display. Monitors the temperature and ensures energy and comfort control on a laminated art board. The manufacturer of this item operates a Ethical Trading Policy (see below) and are members of Sedex. They are also certified to ISO 9001:2008 standards. Review environmental legal and regulatory requirements on a regular basis in order to ensure compliance within the company. Work to increase employee awareness of the effects that their actions have on, and their responsibility to, the environment. Plan to reduce and eliminate waste to landfill as far as is possible in regards to segregation and recycling. Use best environmental practice, wherever practicable, when developing new and existing processes. Encourage our suppliers to provide goods with as low an environmental impact as is possible. Make available to customers, as far as possible, information concerning the environmental soundness of our own products so that they may make an informed choice on environmental grounds. Assist customers to use the company’s products in an environmentally sensitive way. For items branded with your own design, with or without the Green Impact logo - minimum order quantity 250pcs. For orders over 2,000 pcs please contact us for a special rate.